World of Warships, the other WoW, the one without the cowpeople, is now in closed beta, like I just said in that headline up there. If you're looking for a free-to-play multiplayer game set on the open sea, you only have to follow this link, register, and then, er, hope for the best. It is a closed beta after all. The above trailer offers a glimpse of the things you'll be able to do in not-cow-WoW, which include killing other ships, killing baddie planes, and trying not to explode. The water effects look lovely. Not everything is included in this beta, of course, but you will gain access to four warship classes, and be able to level up your crew. 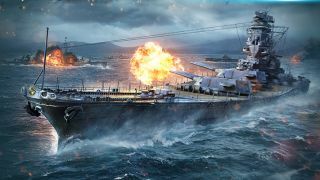 Wargaming.net say of those warships that the "cruisers are nimble vessels; the destroyers’ torpedoes are great for obliterating enemies; battleships are devastating heavy-hitters; aircraft carriers are unmatched in their reconnaissance and sneaky offensives".